EC DG Home published in July 2014 a study with 204 pages on illicit trafficking of firearms and will publish in May 2016 the study about gun crime. Trusted sources told us that the May study will show that gun crime and authorised ownership of firearms have no correlation. But for now we concentrate on the already published study. This one has been used by the EC to support the proposal. End user: criminal or terrorist individuals and groups that procure firearms illegally to use in the pursuit of their goals. Traffickers and other intermediaries: involved in the actual trafficking of firearms either for profit or some other reason. Suppliers: individuals and organisations that provide a source of illicit firearms (either intentionally or unintentionally) who are again likely to be motivated by financial considerations. –> The criminalisation of criminal end users, traffickers and suppliers as well as illicit manufacturers, is likely to reduce the flow of firearms. legally-binding common minimum standards for definition of criminal offences and their sanctions related to illicit arms trafficking. –> Three new regulation should be implemented by EC with stakeholders. The last regulation for deactivated firearms was amended without stakeholders and has to be amended again. –> These suppliers are the right target for more control. The Small Arms Survey showed in its yearbook 2009 that Category A weapons are traded only in 70% with authorisation, but Category B/C/D with 97-99% authorisation, especially if MS are the exporters. 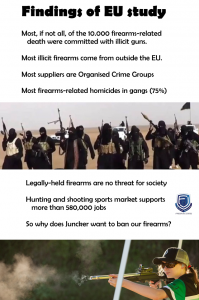 –> No action needed for firearms manufactured within the EU. A significant limitation to collecting and analysing reliable data on the number of illicit firearms seizures is the absence in all EU28 Member States of central databases for reporting information on recovered firearms and ballistic material. –> More information sharing of seized firearms in crimes. –> More control for law-abiding citizens has no impact on illicit trafficking. –> Removing markings should lead to higher sentences in all MS! If deactivated firearms stay in the registers until they are properly deactivated (certified by authorised body), they don’t impose anymore a threat to security. Germany uses this procedure and is very successfull. None of the certified deactivated firearms have been re-activated with ordinary tools. Germany has no problem with certified deactivated firearms. The last entry in the register is the certified gunsmith who deactivated the firearm. This non-shooting firearm is marked with a serial number and proof stamp of deactivation. –> Deactivated firearms need marking and last certified registration! “The study estimated that three-quarters of organised crime-related homicides involved the use of firearms compared to just under 4% in the cases that were not linked to organised crime. “There is substantial evidence that, although firearms availability does not generally affect the rates of violent arguments, disputes or crime, ready availability of such firearms is a significant factor in determining the lethality (or seriousness of injury) of such disputes or crime. –> Authorised and trained owners of firearms don’t see firearms as solution as murder in affect. –> If the market is small and organized by only 36 OCGs, it should be possible to concentrate on the suppliers. “The main sources of illegal weapons within the EU are the reactivation of neutralised weapons, burglaries and thefts, embezzlement of legal arms (e.g. thefts from shops selling firearms), legal arms sold in the illegal market, firearms retired from service by army or police, and the conversion of gas pistols. There is no reliable indication of the proportions coming from these different sources although feedback from our consultations and the workshops suggests that in most EU countries, the reactivation of neutralised weapons is the largest single source of illicit firearms. –> Harmonized regulation for neutralised firearms which deter re-activating with ordinary tools. There are 500.000 unaccounted for firearms – most are NOT STOLEN, but inventory losses. In our report “Gun Ownership in Europe” we showed in chapter “2.2.3.3. Former legal stolen guns” with two Swedish studies and official data by the German government that most of the reported firearms and parts are not stolen, but inventory losses of the firearms registries. On 31st of December 2013 the database listed 17.819 alerts for Sweden and 148.227 for Germany. Sweden investigated all reported gun thefts (n=3,336) between 2003 and 2010. On average 269 guns were stolen annually from legal gun owners. Sweden joined SIS in 2000, so the estimated number of all stolen guns is 3500, not 17.819. The study states also that only 15% of the stolen guns were of use for criminals. But even fewer guns have been misused. Another Swedish study shows that within 10 years a total of nine cases of serious crime took place (i.e. <1 year) using firearms stolen from private individuals, in addition five or six guns were found in connection with crimes being prepared. Similarly to Sweden, Germany records also every year lost guns and gun parts. We know by officers who work in the gun registry that most “unaccounted for” guns are airguns and blank firings guns which did not match the new regulations of 1972/76 and therefore had to be registered. These firearms are missing from estates of deceased gun owners. Also inventory losses account for lots of these losses. Firearms which are registered despite the fact that the firearm does not exist or it is registered with a different serial number or has been scrapped but not removed from the registry. The average number of stolen former legally guns is estimated with a maximum of 500 guns per year. Within 19 years of SIS approximately 9500 guns have been stolen in Germany, not 148.000. “The earlier analysis of firearms-related deaths (see Table 2.3) suggest that although Member States with larger populations tend to have a larger total number of gun deaths, by contrast, the rate of gun deaths is lower in Member States with relatively tougher restrictions on the research on the relationship between firearms availability and lethal violence. Availability of firearms is not typically linked with overall levels of violent disputes or crime in a society, but it is significantly linked to the lethality of such violence. In this context, availability concerns the availability of firearms to people that might misuse them, and not so much to the overall numbers of firearms held by citizens. This is the case in relation to attempted suicides and misuse of arms in the context of family or social disputes: the rates of attempted suicide or violent disputes are not correlated with gun availability, but the lethality of such disputes is substantially correlated. Unfortunately this study did not research its expectation. But we did: Table D of our report on homicide and suicide shows that high and/or low rates of firearms related deaths have no correlation at all with homicide rates. 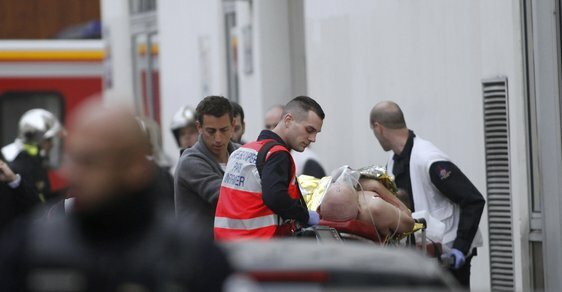 Italy where 38% of the homicides are committed with firearms has an average murder rate of 1,12. England where only 4% of all homicides have been committed with firearms has an average murder rate of 1,37. Austria, Netherlands, Slovenia, Switzerland and Norway have “dream murder rates” which are lower than 1,0. In all five countries more than 24% of these homicides are firearms related. Slovenia and Luxembourg reported no misuse of legally held firearms. The Scandinavian study shows that the Netherlands has a problem with gang-related crimes (chapter 7.1). Switzerland has murder rates of less than 0,6 during the last years, even when 21 to 35% had been committed with firearms (chapter 7.2). –> Neither the number of legally-held firearms nor strongly enforced restrictions lower death rates. “According to a Eurobarometer survey, most Europeans are concerned about the levels of crimes using firearms. Respondents were evenly divided on the question of the level of firearms-related crime in their country. Just under half (49%) thought that there is a high level of firearms-related crime; of these, 12% perceived it to be ‘very high’ and 37% considered it to be ‘fairly high’. However, virtually the same proportion (48%) thought that the level of firearms-related crime in their country is ‘low’, with 9% estimating that it is ‘very low’ and 37% saying that it is ‘fairly low’. It is important to note here that this question relates to perceptions of firearms-related crime. While they are a useful measure of public concern, opinions are also likely to reflect differences in media coverage of such crimes. Of the participants of the Eurobarometer 90% do not have firearms and have never had any. These people have no experience of the existing national legislation or the EU Directives. But even of these inexperienced citizens on matters of firearms legislation, only 53% supported stricter regulation. A majority of respondents (53%) think that stricter regulation of who is allowed to own, buy or sell firearms in their country is the most effective way to reduce the level of firearms-related crime. However, four out of ten respondents (39%) think that this would be best achieved in some other way. has been totally ignored by the EC and the studies. For instance, 92% of respondent opposed extending the list of prohibited firearms, as defined in Annex I Part II of Directive 91/477/EEC. Some responses were overall more mixed: on the question of how frequently each Member State should report on its progress in tackling firearms trafficking, 50% responded “never”, 29% “regularly” and 17% “occasionally”; on the question of developing police training for tackling firearms trafficking, 44 % supported such a development either “to a large extent” or “to some extent”, while 54% opposed it. “In comparison to many other sectors of the European economy, the availability of data on the arms and ammunition sector is often restricted by issues of confidentiality. Therefore, the likelihood of an under-reporting of arms production and sales must be borne in mind. However, it is clear from the Eurostat and IEACS data that the licit European arms sector employs a large number of people and that it generates significant revenue for the Member States and European businesses. Based on the earlier estimates of illicit firearms trafficked within the EU (see Section 2.1.2) it is clear that illicit firearms are likely to make up only a small (albeit impossible to quantify) proportion of the total firearms market which includes both civilian and military weapons. –> The last sentence is important. For a number of reasons, it is not possible to gain a comprehensive overview of existing cross-border cooperation between national authorities responsible for combatting illicit firearms trafficking. Every person who [specify level of intent, as appropriate] imports, exports or otherwise acquires, sells, delivers, moves or transfers any firearm or its parts and components or ammunition from or across the territory of [name of State] to another State without legal authorization [a licence] issued in accordance with [name of this Law] commits an offence. A person guilty of an offence under paragraph 1 of this article shall upon conviction be subject to [imprisonment for …] and/or [a fine of/up to …] [a fine of the … category]. Every person who [specify level of intent, as appropriate] imports, exports or otherwise acquires, sells, delivers, moves or transfers any firearm from or across the territory of [name of State] to another State that have not been marked at the time of manufacture, at the time of import or at the time of transfer from government stocks to civilian use in accordance with chapter IV of this Law commits an offence.